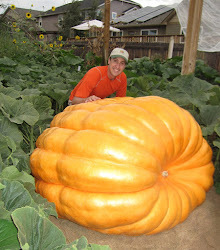 Giant Pumpkin Growing Tips From The Pumpkin Man: We Have a Pumpkin Patch in Utah! We Have a Pumpkin Patch in Utah! It has been over a year since I could say I had a pumpkin patch. With the move, I didn't grow last season and it was a little sad to see my neighbor cover the old patch with piles of dirt. Yesterday evening I tilled about 3 yards of compost into the new patch along with some nitrogen, sulfur, humic acid, peat moss, manganese and iron. Last night I also took a bucket full of sand and put in a little humic acid and liquid seaweed with some winter rye grass seed and wetted it to help pre-germinate the seed. I then put that seed down at lunch today when things warmed up and racked it into the soil and then gave it a good watering. I'll then cover the patch with plastic to help warm it up and which will increase the germination rate. Weather here in Utah lately has been relatively warm. Early mornings lately have hovered right around 32 degrees, but day time temperatures are forecast in the 60s and low 70s for the next week, which will be ideal for getting that cover crop going before the first hard freeze. That winter rye cover crop will be tilled into the soil in the spring which will add organic matter and nutrients that will be available to the pumpkin patch next year.